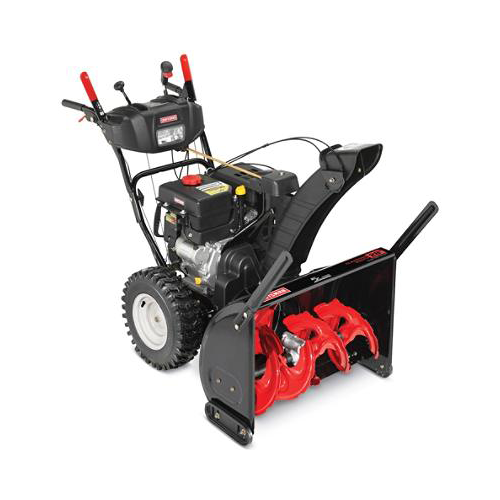 Includes: Craftsman® 28” 243cc Dual-Stage Snowthrower with Quiet Engine. Craftsman 243cc Quiet Engine - 45% Quieter/Push-Button Electric Start Allows For Easy and Sure Starts In Cold Temperatures/28 In. Clearing Width and 21 In. Intake Height Lets You Clear More Snow With Each Pass, Ideal For Medium To Large Paved And Gravel Driveways And Sidewalks/12 In. Serrated Steel Auger and 12 In. Impeller Breaks Up Hard-Packed Snow And Discharges Heavy, Wet Snow/6 Forward and 2 Reverse, Power-Propelled Speeds Save Time And Energy, Allowing Operator To Adjust Speeds To Match Need/4 Way Chute Control - 200 Degree Chute Rotation Control With The Ease Of A Joystick To Discharge The Snow Where You Want It, Without Leaving The Operator's Position/Glide-Tech™ Skid Shoes Eliminate Garage Rust Stains And Driveway Damage, By Sliding Along Pavers And Bricks/Single Hand Operation Eliminates Starts and Stops, Freeing Up A Hand For On-The-Go Adjustments/Mitten-Grip Starter Handle - Easy To Grasp and Turnover Recoil Start While Wearing Gloves/Plow Style Handles for Comfort And Control With Panel Design For Convenient Shear Pin Storage/LED Headlight. 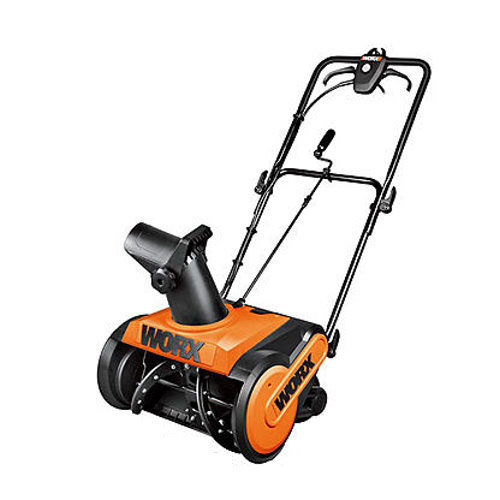 Includes: Worx 18" Electric 13 Amp Snow Thrower With Replaceable Rubber Tip No-Mar Steel Auger. 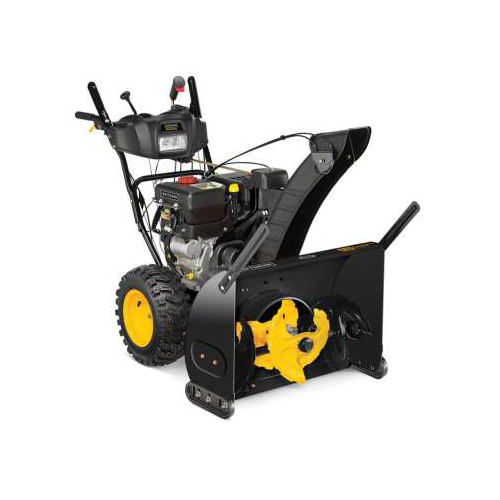 Features A No-Mar Steel Auger With Replaceable Rubber Tip That Helps Protect Pavement/ Rapid Turning Auger And Powerful 13 Amp Motor Sends Snow Flying Up To 30 Feet Away/ 180 Degree Chute Rotation And 45 Degree Angling Gives You All The Control To Send Snow Where You Want It/ The 18” Wide Mouth Along With The 10 Inch Intake Height Easily Deals With The Remnants Of Heavy Storms/ Studded Blade Design Takes Care Of Crusty Snow Fast/ Grippy Wheels Enhance Traction/ Back Saving 3 Position Height Adjustable Handle Delivers Superior Control While Easily Collapsing For Simple Storage/ Plug In Design Eliminates Annoying Pull-Starting And Mixing Fuels/ Oversized Chute Adjusters For Easy Use With Winter Gloves/ Rugged Build Is Designed To Last Winter After Winter. Includes: Craftsman 28" 357cc 3-Stage Snowblower w/ Power Steering. When the White Stuff Falls, Clear Your Path with The Craftsman Pro Series 28" 357cc 3-Stage Snow Blower. To Make Quick Work of Large Areas, the 28" Clearing Width Handles More Snow with Each Pass. If the Snow Has Piled Quickly, This Thrower Features A 21" Clearing Height. The Auger, Impeller and Accelerator Help to Break Up Hard Packed Snow. Featuring 6 Forward And 2 Reverse Speeds, You'll Be Able to Go at Your Own Pace. 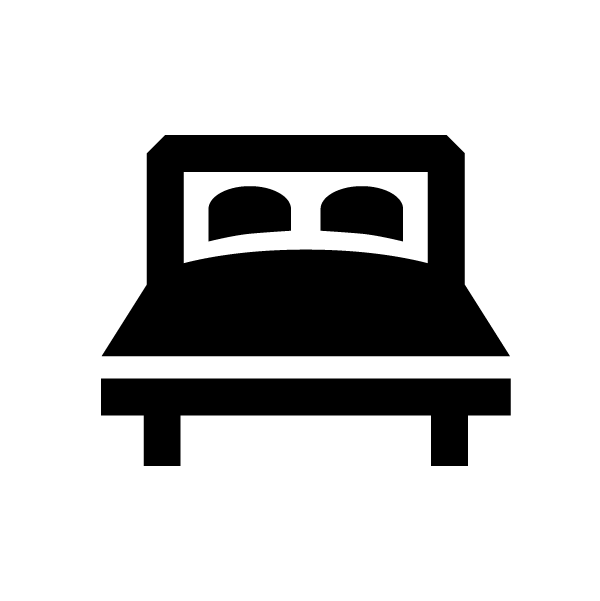 Plus, Power Steering Takes Some of The Strain Out of Pushing Your Snow Blower. Make Quick Work of Snow Removal with The Craftsman Pro Series 28" Three-Stage Snow Thrower. Handle Large Swaths of Snow with Each Pass Thanks to The 28" Clearing Width And 21" Intake Height. 4-Way Chute Control – 200 Degree Chute Rotation and Pitch Control Discharge the Snow Where You Want It. Extended Chute Design Keeps a Tighter Discharge Pattern To Increase Throwing Distance And Reduce Snow Blowback.